Good Grief! It has been over one month since I last posted!! I would love to say something like “Time flies when you’re having fun”. I would like to tell you that I won a squillion (squillion = much more than one million) dollars and I was busy trying to find ways to spend it. Or maybe that I was a spy for the CIA and that espionage took up a whole heck of a lot of time. Or that I was just out living it up and having boat loads of fun. But believe you me, I have decidedly NOT been having fun. When I last left you, I believe I was apologizing for not posting for a while (hmmm….this seems to be becoming a habit…) because I had been on holiday in Ireland and was a bit jet lagged. Well, I caught some sort of crud on that plane coming home. I remember sitting on that flying hospital ward and thinking to myself that it would be a miracle if I didn’t get sick, cause everyone around me was hacking and wheezing non-stop for the eight-hour flight. Don’t you know it, about 4-5 days after getting home, wham! I got smacked with some cold. And it wasn’t one of those little annoying things that you can go basically go about your normal business with, albeit with a box of tissues in tow. No it was a bear of a thing. Grizzly, not black bear. I used so many tissues I was sad I didn’t own stock in the Kleenex company! Just when I about had that one kicked, and was ready to dive into blogging again, we lost power for 3 days with Hurricane Sandy. And then, KAPOW! Another coldy/virusy thing descended upon me. I know I said the last one was a bear, well this one was essentially Godzilla! It totally body slammed me to the floor and proceeded to do some sort of celebratory dance all over my prone body. Seriously, it was bad news. And then, apparently I was in the sharing mood, cause I passed it on over to my poor unsuspecting husband, whose usual immune system of steel was unable to protect him from this nightmare. So, I’m sure you can see, there hasn’t been a whole heck of a lot of “fun” going on around here! The good news is, we both seem to be on the road to recovery. I’d appreciate it if everyone would cross their fingers (and perhaps toes) for us at this point! So enough of our trials and tribulations for now. Please accept my apology for the disappearing act. 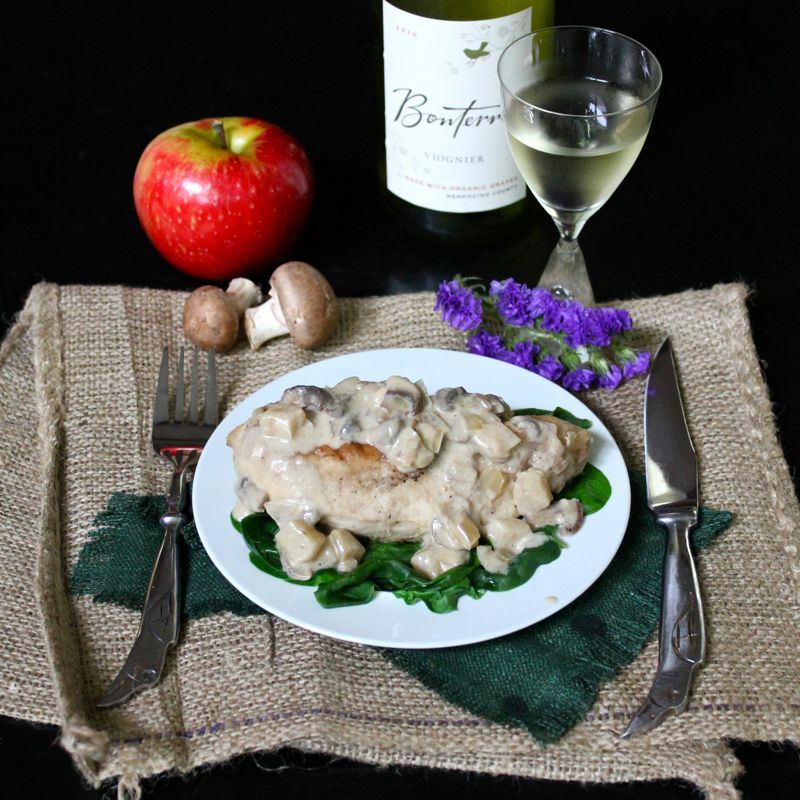 I’ve finally re-emerged with a lovely Fall recipe, Chicken, Apples and Cream à la Normande, from Dorie Greenspan’s Around My French Table. 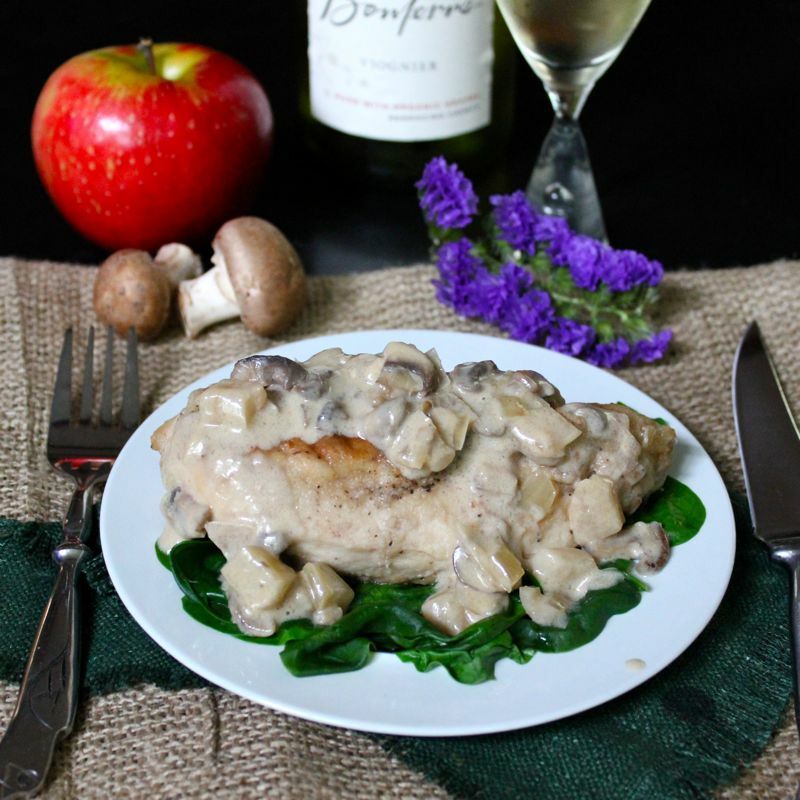 This dish doesn’t have a whole ton of ingredients, mainly just chicken breasts, mushrooms apples, cream and Calvados (an apple brandy from Northern France), but it tastes wonderfully decadent! It also looks quite fancy, but it very easy to make. 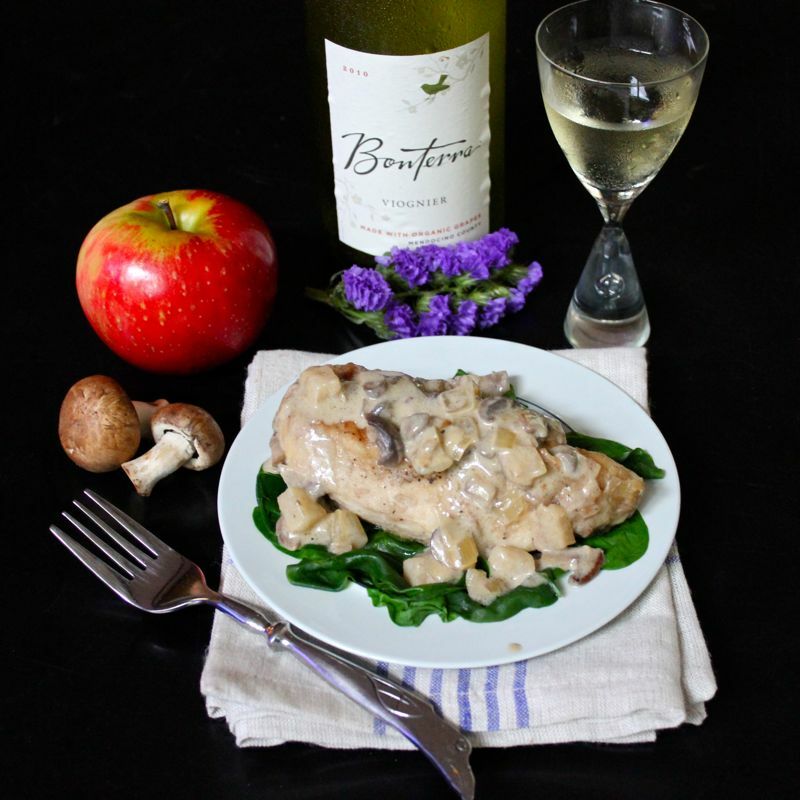 I served mine on a bed of Lemon-Steamed Spinach which paired perfectly with the apples and cream sauce. Put some flour on a plate and season it with salt and pepper. Pat the chicken pieces dry and run them through the flour, coating both sides lightly and tapping off the excess. Put a large deep skillet over medium high heat and add 1 tablespoon each butter and oil. When the butter is melted, slip the chicken into the pan. Cook for 3 minutes, to brown the undersides, then turn over and cook for 3 minutes more. If you’re low on butter and oil, add a little more now, then toss in the apple, onion and mushrooms. Season with salt and pepper and turn the new additions around so that they’re well mixed and glossy with butter and oil. Cook for 1 minute, then pour in the broth. When the broth bubbles, reduce the heat and cook for about 10 minutes or until the chicken is almost cooked through. Turn the heat up again, pour in the Calvados and boil until it’s almost evaporated, about 1 minute. Add the cream and keeping the heat on high, cook until the cream reduces by about one quarter, a matter of a few minutes. Taste the sauce for salt and pepper. arrange the chicken on a dish or on a bed of steamed spinach if you wish, pour sauce over it. Have your steamer set up and ready to go. Put the spinach in a bowl and toss it with 1 tablespoon of the oil, the zest and salt and pepper to taste. Taste for seasoning and if the spinach looks dry, add some or all of the remaining olive oil. Turn the spinach into the pot, cover and steam for 3 minutes. Turn spinach and cook for another minute or two until it is tender. The spinach should be served as soon as it’s cooked. You are currently browsing the Lea & Jay blog archives for November, 2012.